That's right CLIF SHOT� is no longer just an energy gel. Now, when you see the CLIF SHOT� name you'll know you're looking at products made specifically for performance-oriented athletes. CLIF SHOT's� goal is to provide the best tasting and scientifically-backed products that are made with sustainably grown ingredients. We believe that energy products can taste great and can utilize organic ingredients that have positive environmental impacts. It's that simple. 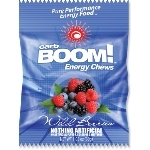 Carb BOOM Energy Chews - CarbBOOM Energy Chews are just the thing to have on your workouts. They are easy on your GI and will give you energy to get you through your race/workout. Clean and natural energy source: complex carbohydrates, natural ingredients. These fructose-based, citrus flavoured energy tablets, are particularly recommended to reduce fatigue in every situation: sports, work and free time. Accelerade Accel Gel features all-natural whey protein and carbohydrates in a patented 4:1 ratio to help endurance�athletes performance and speed recovery. Water, Maltodextrin, Whey Protein Isolate, Dextrose, Glycerine, Fructose, Sucrose, Modified Food Starch, Cocoa Powder, Salt, Ascorbic Acid, Natural Flavor, Vitamin E Acetate, Caffeine, Sodium Benzoate and Potassium Sorbate (Preservatives).